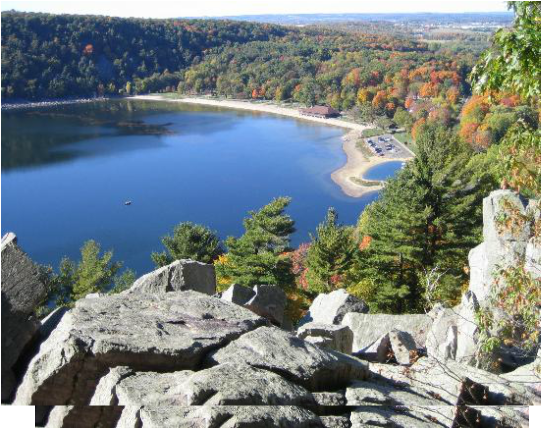 On Tuesday, August 7th, 2018, we will have an optional day trip to Devil's Lake located in beautiful Baraboo, WI. This trip is intended to be one of many team building activities that encourages team unity while celebrating all of the hard work our athletes have put in during the summer months! We have reserved a charter bus for the trip. Seating on the charter bus is limited to 56 seats. Athletes will reserve their spot for the trip on a first-come-first-served basis throughout the summer. Athletes can bring payment to Coach Ressler at the summer morning training sessions. Cost: $25, bus ticket, lunch, and picnic shelter. Dinner: If the team is hungry, we will stop at a fast-food restaurant on our trip home. Therefore, you will also need money for purchasing dinner. Practice: In order to conduct such a team trip, we will hold practice at 6:00 am SHARP! We will begin practice at Hempstead H.S. track. We will execute our workout in a timely fashion in order to shower and load the buses by 8:00 am. Misc. : Bring toiletries for showering before trip and upon leaving Devil's Lake, change of clothes, beach towel, sunscreen, frisbee, football, hiking shoes, etc.